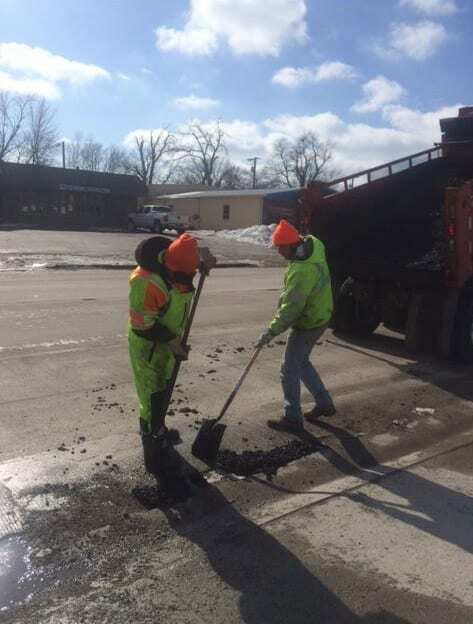 With snow and ice, and temperatures fluctuating from the 40’s to sub zero, potholes sprout up overnight. County and city crews keep busy. Trying to keep potholes to a minimum is a priority for city staff who tries to be proactive in identifying and responding to potholes. On inclement weather days staff develops a pothole list. Arterial roadways are checked first, followed by residential roads. Typically, a repair crew is dispatched once a week, depending on the workload. All pothole repairs are to be permanent, using hot mix asphalt unless otherwise directed by a foreman or supervisor. 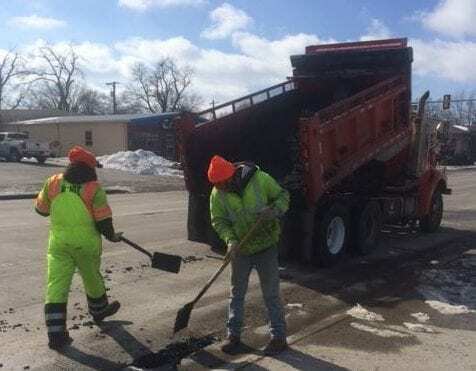 It’s not uncommon to see crews in bright vests shoveling asphalt into holes and tamping it down, but there is an exact method to what they do. • Set up a work zone in accordance with Part VI of the MUTCD manual. • Square up the sides of the hole with either a skid steer milling head or a jackhammer. • Remove the material until a firm base is achieved (minimum of two inch depth). • The pothole must be free of all debris, water and broken asphalt. Blow out fine particles with air tools. • Apply tack coat to bottom and sides of the hole and allow it to cure. • Fill with asphalt to the proper height to allow for a smooth surface once compacted. • Compact the asphalt with either a vibratory plate compactor or a vibratory roller. • The work area should be inspected at the end of each day to assure that the site is clean and that all the tools and equipment have been picked up. • When the work is completed, the work zone is removed.